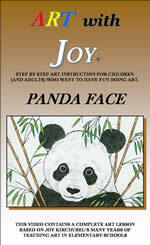 Students draw and color a panda face and bamboo using a circle pattern, pencils, pens, and colored pencils or markers. This lesson teaches interesting and fun facts about pandas and discusses their natural habitat and legal protections for them since they are an endangered specie. The lesson demonstrates how to color effectively with colored pencils. 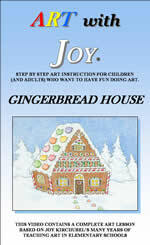 Students draw and color a gingerbread house using pencils, pens and colored pencils or crayons. In this lesson two different ways of drawing the houses are demonstrated. 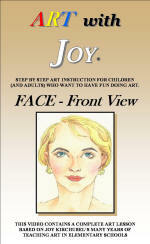 For younger children there is a simple front view and for third graders and older, a three dimensional view. The lesson discusses straight lines, curving lines, parallel lines and perspective, encourages students to compare the height of the roof area to the height of the bottom section of the house, and demonstrates shading the snow and putting a shine on the candy. The lesson also briefly relates the fairy tale of Hansel and Gretel. 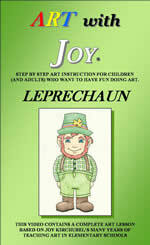 Students draw and color a leprechaun using two circle patterns, pencils, pens and colored pencils or crayons. Students turn two circles into a fun leprechaun with a happy or cranky expression on his face. They add arms, legs, beards, hats, shoes and clothes, keeping in mind realistic proportions (as realistic as can be for a leprechaun). The lesson discusses leprechauns; what they look like, where they can be found and what they do. Students draw a cartoon door knob upside down, copying each line, shape and space as accurately as possible. When they have finished they turn their papers right side up and are usually very surprised to see how great their door knob looks. Students are then free to add cartoon arms and legs and a fun background. This lesson is one of the students’ favorites. 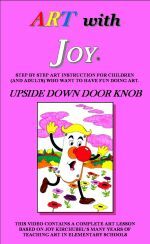 Drawing the door knob upside down helps the student to access the right side of his brain and see things exactly as they are. The logical left brain knows too much about things and tries to tell the artist what SHOULD be there instead of seeing what IS there. Children draw and color portraits of each other. Using pencils and fine point makers (optional) for drawing, and crayons of colored pencils for coloring. Teaches children to observe proportion and the placement of the features as well as the special characteristics of their model, such as freckles, hair styles, etc. 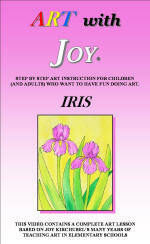 Students draw and paint two iris’ using pencils, pens and watercolors. Teaches the simple geometric shape of the flowers. Teaches how to paint and shade them to make them look soft and more realistic. Shows how to paint a watercolor wash for the background. Students use pencils, pens, crayons and watercolors to create a wonderful jack-o-lantern in the sky. 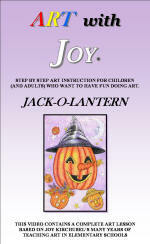 Teaches shading and how to make the jack-o-lantern look round and three dimensional. Teaches placement of eyes, nose and mouth in a face. Teaches how to color him and wash watercolor right over him [crayon resist] to make a sky. Suggests fun things to add to the sky. Lesson teaches that a work of art can be just form and color. 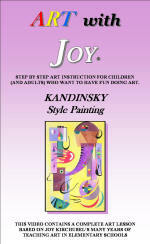 Discusses some of what Kandinsky wanted to express through his nonobjective paintings, his striving to convey mood and emotion through color and form and his joy in the beauty and simplicity of geometric shapes. Using crayons to draw and color haystacks in a field in the manner of Claude Monet. Emphasis on light and shadows (in complementary colors) and on coloring a landscape as it really appears, full of many beautiful colors. 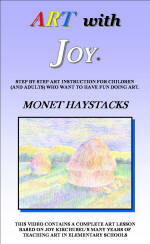 Discussion of Claude Monet and Impressionism. Students draw and color a great face in the cubist style of Pablo Picasso using pens and colored markers. Students learn about cubism and the wonderfully creative life of Pablo Picasso. Lesson discusses his constantly changing style and his passion for his work. 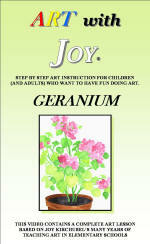 Painting Geraniums growing in a pot using any color in the watercolor box for the flowers. Teaches how to paint the blossoms and leaves in two layers of color so the plant has depth and shading. Teaches children how to blend colors together. Students draw and color a cute puppy face using pencils, pens and colored pencils or crayons. The lesson teaches students how to begin with a basic circle and gradually change it into the shape of a puppy’s head. Both a realistic and a cartoon face are demonstrated and the children are free to choose which kind of puppy they want to draw. They often draw a dog they know. The lesson discusses proper proportions, different kinds of ears, simple backgrounds and texture. Students use pencils to sketch a rabbit and a background. Complete the drawing with pens and crayons or colored pencils. 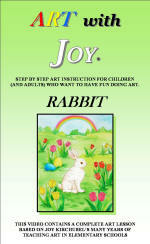 Teaches how to estimate correct proportions on the rabbit. 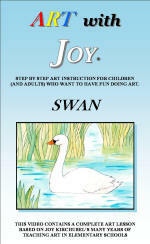 Presents ideas for several different backgrounds and encourages children to create their own. Students draw and color a wonderful Santa face using pencils, pens and crayons. Lesson teaches students to sketch the basic round shape of Santa’s face adding the features, mustache, beard and hat. Lesson also discusses how to shade his face, hair and hat so they look more real and three dimensional and teaches how to make the eyes look bright and alive. Works well as two sessions - students draw with video & can color on their own. Drawing and color in a snowman. Teaches perspective on a sphere and proportion while drawing a fun fantasy snowman using black and colored markers. 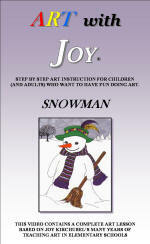 Encourages kids to use their imagination and have fun with art. Level of difficulty - 2 or 3 (dependent on art experience and maturity of the student). Students draw and paint a floating swan using pencils, pens and watercolors. Lesson shows students how to use their pencils to measure the proportions of the swan. Demonstrates how to draw tall grasses coming out of the water. Teaches how to paint water and how to represent reflections in the water.